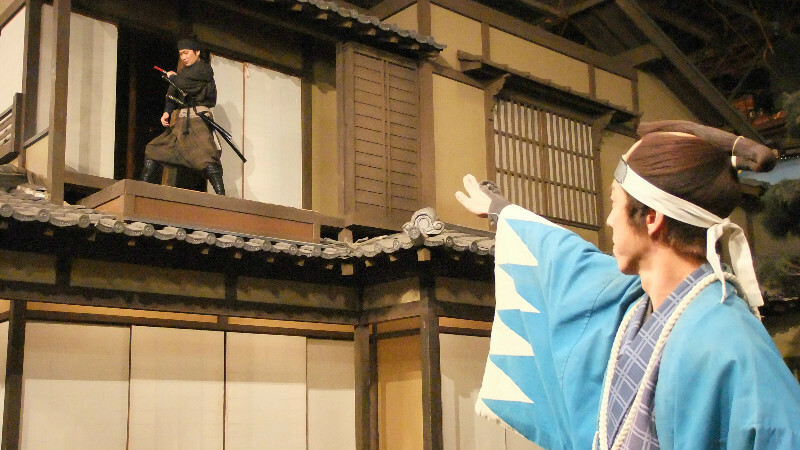 Toei Kyoto Studio Park offers an Edo and Meiji period experience that is the perfect choice for those who want to not only see samurai and ninja performances, but also wear costumes and become historical characters themselves. 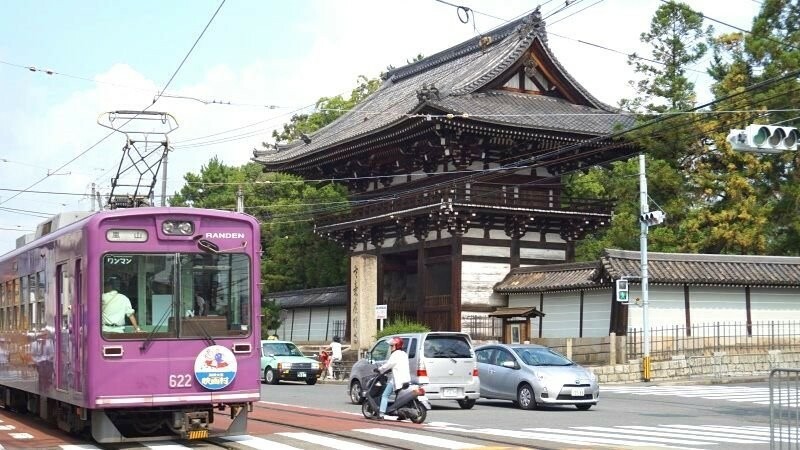 Are there any places in Kyoto that are great fun for both families and young people alike? 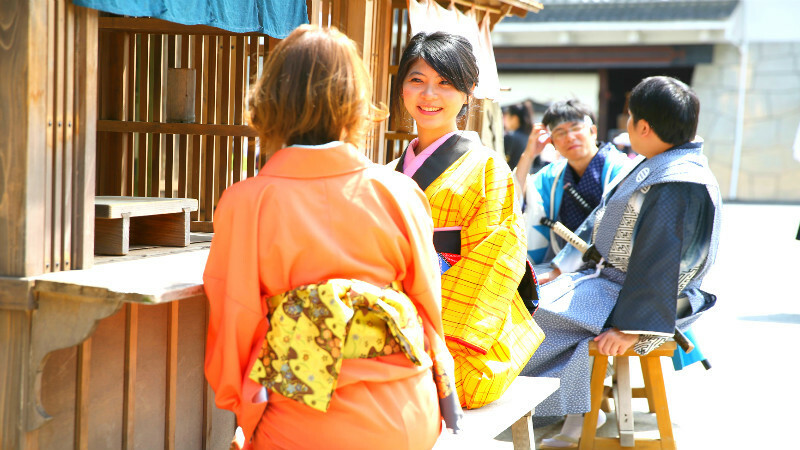 Yes there is, Toei Kyoto Studio Park offers an Edo and Meiji period experience that is the perfect choice for those who want to not only see samurai and ninja performances, but also wear costumes and become historical characters themselves. So, come join Vanessa on her day at Toei Kyoto Studio Park, and see how she transforms from a peasant girl into a princess! From September 16, 2017, to January 8 there are many Rilakkuma events that take place in Kyoto, like a “stamp rally” where you get to stamp a booklet with Rilakkuma rubber stamps at many different places in Kyoto, there are Randen tram cars with pictures of Rilakkuma on them, the convenience store Lawson sells Rilakkuma themed merchandise, and there is a Rilakkuma themed café in Arashiyama (that you can even visit after the event itself has ended). 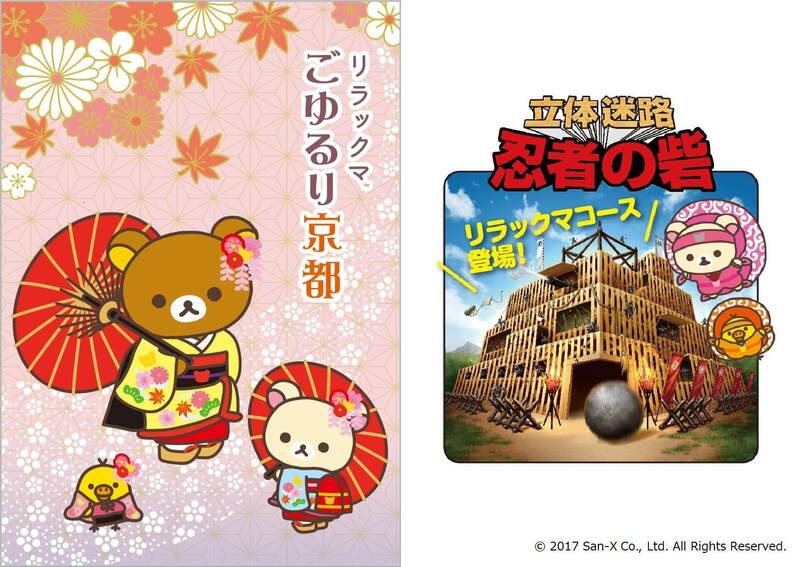 And at Toei Kyoto Studio Park there is also a Rilakkuma event: Rilakkuma himself will show up at the 3D Maze The Ninja Fort! When you are in Kyoto, remember to not only look at the autumn leaves but to also dive into the world of Rilakkuma! Toei Kyoto Studio Park is a film set that is open to the public, and at the park you get to actually walk on the film set, and feel like you were transported back in time to the Edo period of Japan, 400 years ago. It’s almost as if you took a time machine to go back in time! 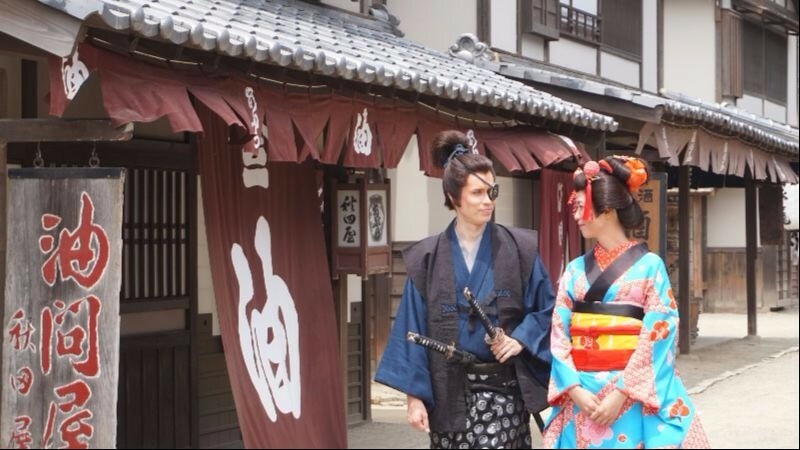 And when you see a geisha in the streets, you just have to take a picture with her! If you can hear a clatter of swords, that means there is a chanbara show taking place close by. The show at Toei Kyoto Studio Park is called Tsujishinan, and after the show, a few audience members get to partake in it. It’s like you were a real actor in a samurai movie! I went to Arashiyama in the morning because otherwise there would be too many people, and in the afternoon took Randen to the studio park. You could also get a one-day ticket for Randen, this way it would be more convenient and also cheaper. We are here at Toei Kyoto Studio Park! From the closest Randen station, Koryuji, it’s a 5-minute walk to the studio park. You buy the tickets on the ticket counters that are next to this entrance. When you get inside the park, the place just looks completely different from outside! You truly are transported back in time. Remember to take many pictures here; the place is just full of great photo spots. 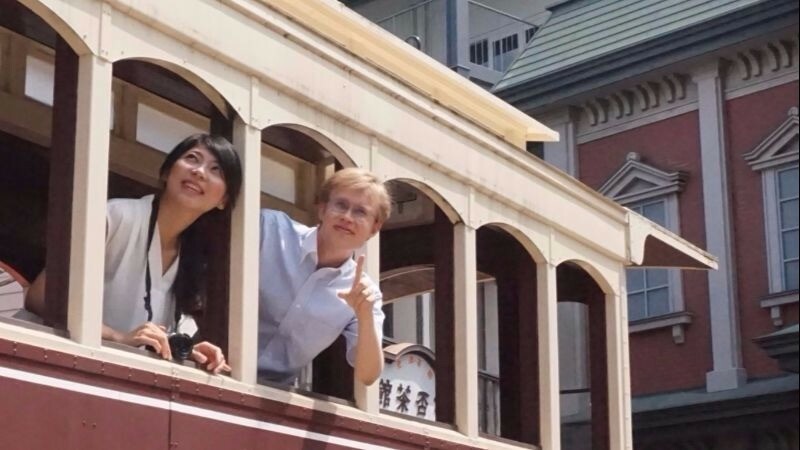 This old tram car is on Meiji Street, and even if you have to line up, it’s still worth it to take pictures inside this classic tram car. Yoshiwara District was an officially recognized red lights district in Tokyo in the Edo period, back when Tokyo itself was still known as Edo. You can also go into the buildings on the street and take pictures! So you can take funny pictures like this. Lastly, one of the most classic bridges in Japan, Nihonbashi, which you can find on the south side of the park. This old wooden bridge is just the perfect place to take a few pictures, no matter whether you are wearing a kimono or not. So, me, Vanessa, and Sampo also decided to have our picture taken here. After strolling around the park for a bit, it’s time to watch an action-filled play! 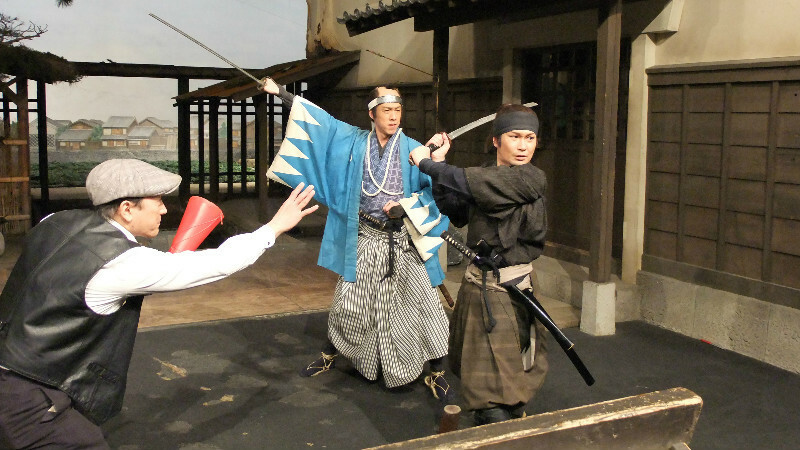 The actors are all pros and this is also a good chance to understand Japanese culture even better. This show lets you see some great samurai-action, and by the end of the show, you get to participate in it too. The place where the show is held is close to the Nihonbashi Bridge, and there are four shows a day, so be sure to go see one of them. 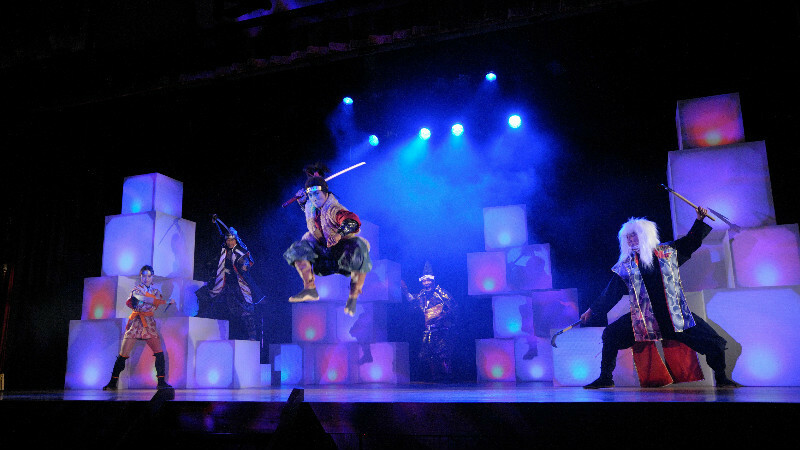 Here you have a ninja action show with the famous ninjas Sarutobi Sasuke and Hattori Hanzo, with specials effects made possible by 3D projection mapping. I was awe-struck by how action-packed the show is! 3Cinema Studio Live! Last we have a show where you get to see how the movies and period dramas are actually filmed, so in effect, you get to go backstage! Getting to see how period dramas are filmed is something you cannot experience every day! 1Enjoy Toei Kyoto Studio Park’s classic Ninja Parfait! There is no better way to relax at Toei Kyoto Studio Park than by sharing a big Ninja Parfait with your friends at the café Kahisakan! The parfait is made out of layers of matcha and vanilla ice cream, pancake, and topped with cherries and orange slices. 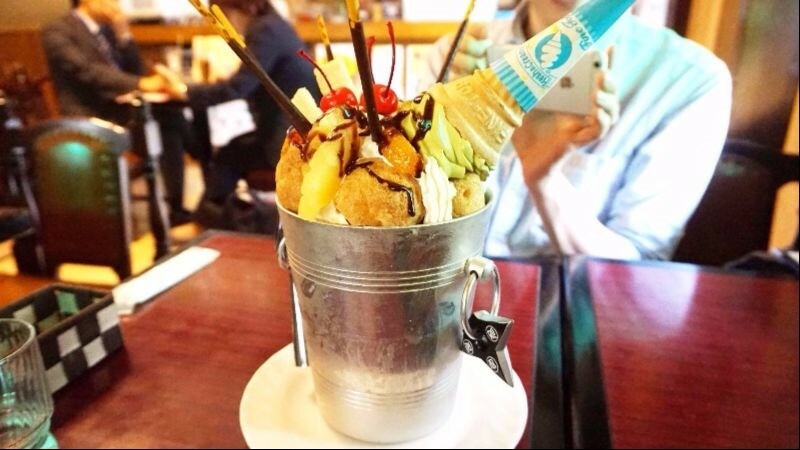 And you get matcha soft serve on top of this all, making this a truly photogenic parfait! There is really a lot to eat in this parfait, so it is recommended for 3-4 people. At Kahisakan they also have other menu items like sandwiches and pasta, so you won’t go hungry. This café is not only a good place for a break, but also nice for lunch. 2Souvenirs you can only get at Toei Kyoto Studio Park! There are eight places at the park where you can buy souvenirs, and the biggest one of them is the Studio Market inside the Padios main hall. 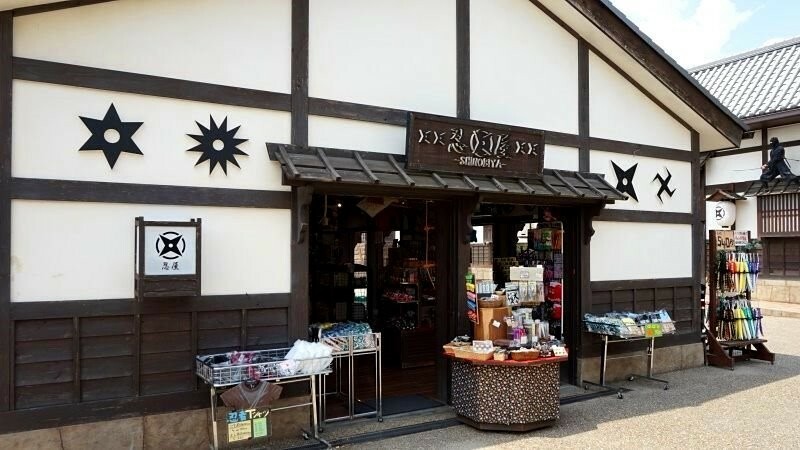 They sell such Kyoto classics as yatsuhashi and tsukemono, and all kinds of other souvenirs, but there are some souvenirs you can only get at the studio park. Shinsengumi and ninja souvenirs are of course really popular! 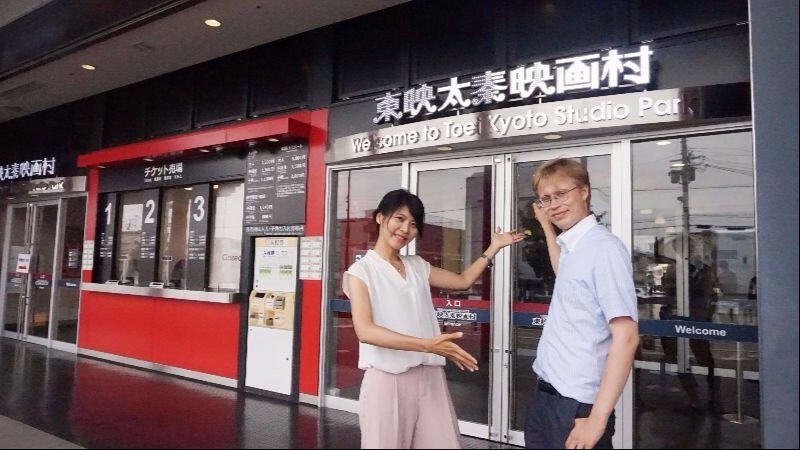 So, Toei Kyoto Studio is a great place to have some fun for both adults and children; there is just so much to see and do at the park! 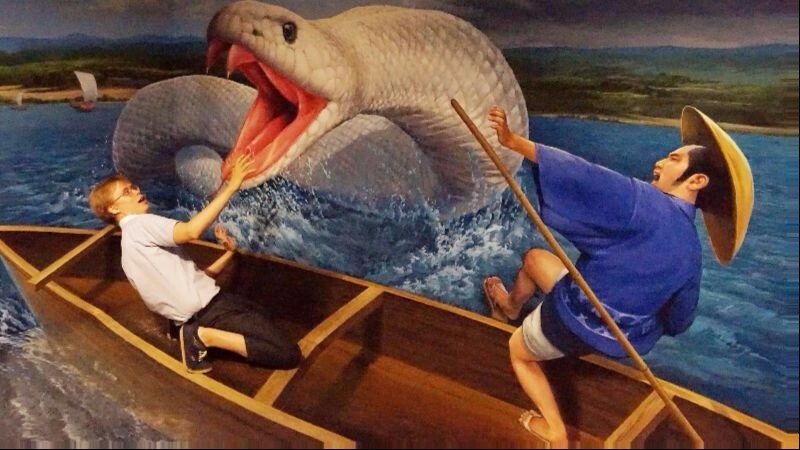 If you want to have fun for the whole family in Kyoto, go to Toei Kyoto Studio Park! Extra: How can you enjoy Toei Kyoto Studio Park even more? Since you are at the studio park, how about enjoying it even more? 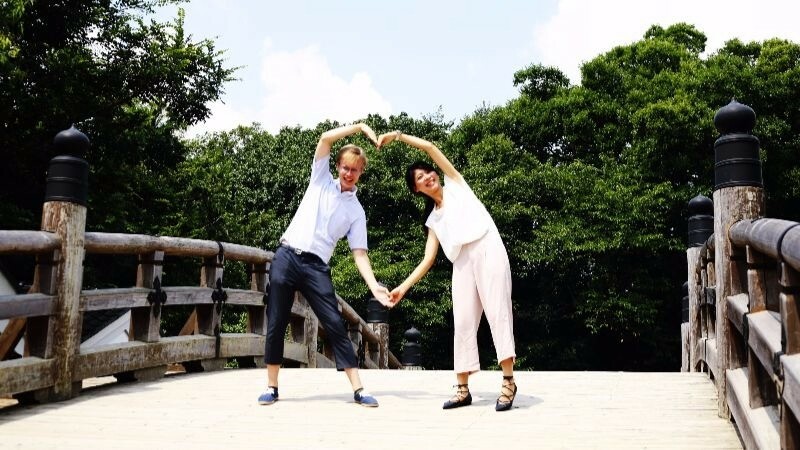 For those of you who want to do just this, we have two ways to enjoy Toei Kyoto Studio Park even more! 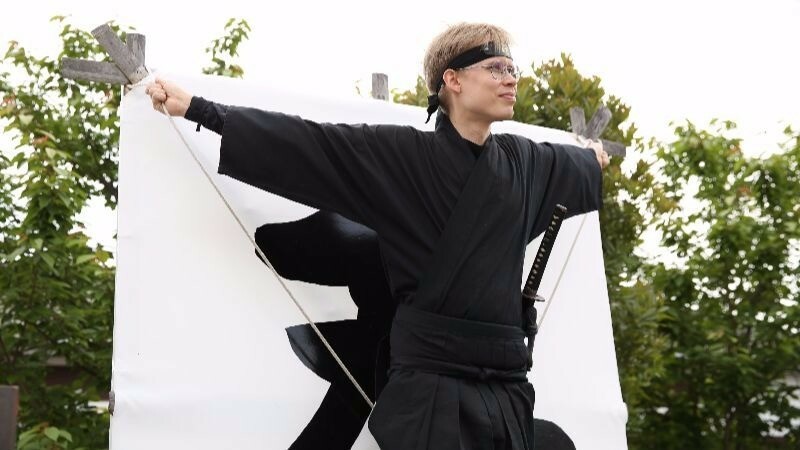 Here you can see our staff writer Sampo trying to fly like a ninja-Icarus. There are 11 types of costumes for adults, and 8 types for children over 110 cm. The best way to enjoy these delightful costumes is to take pictures at the photo spots you saw earlier in this article. *Note that you cannot walk outside in case of rain. The second way to enjoy the studio park, even more, is to go to the many attractions you can go for a small additional fee. In the Trick Art Museum of the park, you can take really interesting pictures! SWORD ‘N GO is a new attraction that just opened in March 2017. This attraction combines swords with an obstacle course in a new and exciting way. The tickets are 500 yen for adults and 400 yen for children. You can also get a set of four tickets for a cheaper price. These tickets are great for those who want to go to many attractions that require an additional fee. 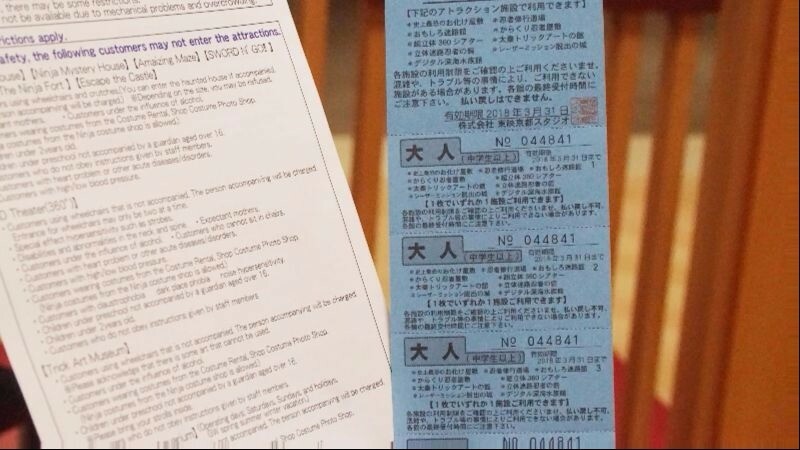 These tickets cost 1,600 yen for adults, and 1,200 yen for children, both for four tickets. After having spent half a day at Toei Kyoto Studio Park, we can safely say that this is one of the most fun places to visit in the whole of Kyoto! There are still many things to see and try at the studio park that we didn’t have time to touch upon this time, so the park really is a place where you can easily spend half a day at least. 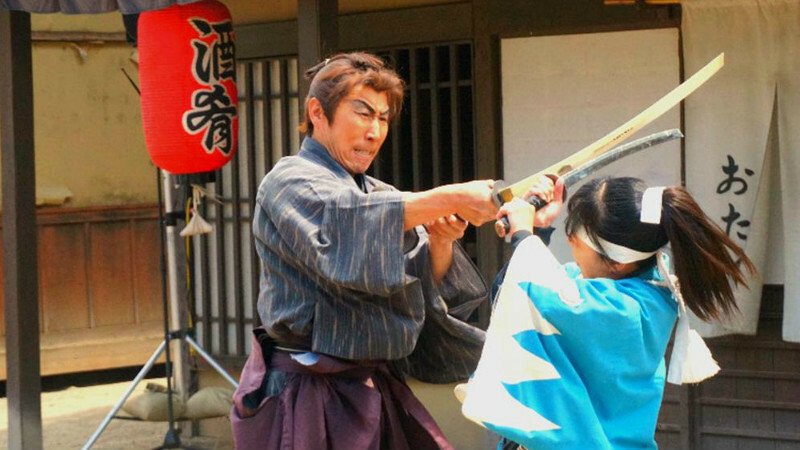 Toei Kyoto Studio Park is one of the best places in Kyoto to get to know historical Japan. 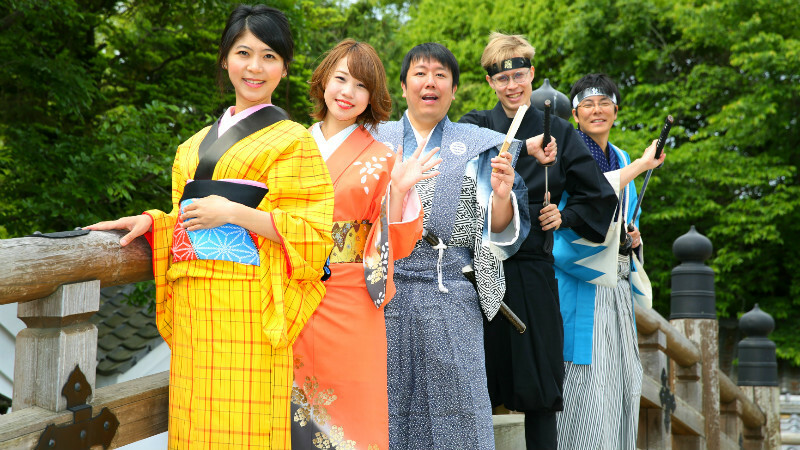 You can also become a historical figure here by donning the costume of a samurai or a daimyo, so for those who like history, and especially Japanese history, you cannot miss Toei Kyoto Studio Park! Eat hot food to get through the cold winter of Kyoto! 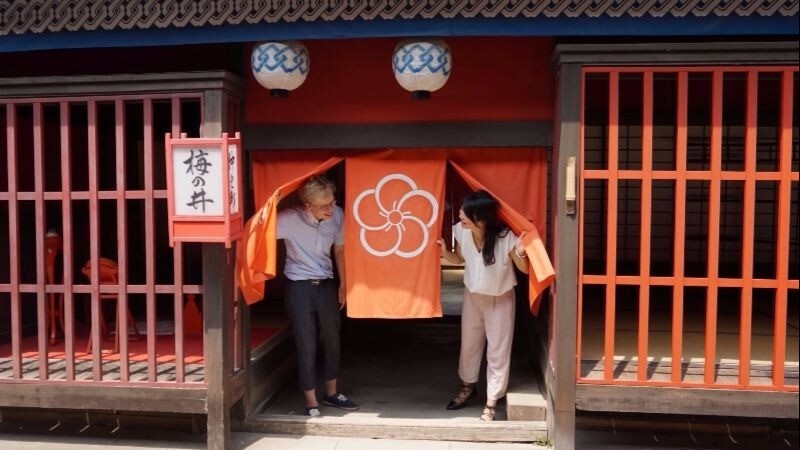 Eat, drink, and play in Kyoto – in Nanzen-ji and Okazaki! Already a Sharing Kyoto member ?